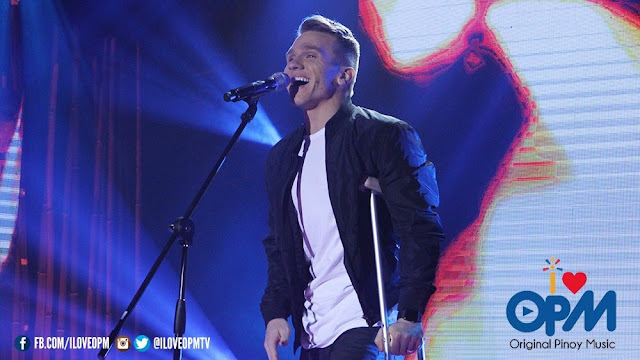 MANILA, Philippines - American touristar Daniel Herrington brings good vibes as he sang Janella Salvador's "Mahal Kita Pero" on ABS-CBN's Filipino reality music competition "I Love OPM" on Sunday, February 21, 2016. Daniel though injured due to motorcycle accident impressed the judges called "Himig-gration Officers" on his cool rendition. "Ang sarap ng boses mo, parang Jason Mraz. Ang galing!" judge Lani Misalucha said. "You're a great addition to what we have here" judge Martin Nievra told Daniel. Daniel will continue his journey on the the competition as he received "Approved" rating from the judges. Meanwhile, Daniel's wife Nathalie was present at the studio to support him. The couple revealed their love story blossomed in Cagayan de Oro City as Nathalie has work there. They also plan to stay in the country for good. Hosted by Anne Curtis and comedian Eric Nicolas, "I Love OPM" airs every Saturdays after "Maalala Mo Kaya" and Sundays after "Rated K." The contest will shine the spotlight on foreigners who can fluently sing local songs.